My big thank you post at the end of a crazy week. 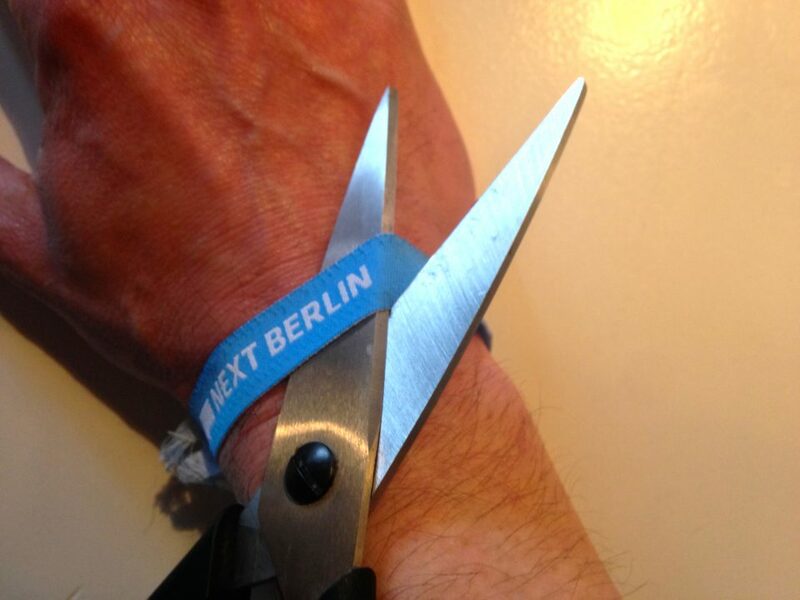 Today I cut off my NEXT14 wristband. Another event which we worked for over the course of one full year is finally over. It feels a bit like cutting the umbilical cord. (I know it because I did it two times in my life when our sons were born.) Time for a big thank you post. First of all, I'd like to thank Mattes Schrader for letting me do this whole insane crazy thing called NEXT. This baby was born almost by accident in 2006, eight years ago, and somehow managed to survive - despite a humongous appetite for attention, time, effort, and cash. NEXT never really was a business for SinnerSchrader. NEXT is a lot of fun and a great marketing tool at the same time, but it comes with a huge risk. Few people know that we not only never made money with NEXT but invested lots of time, effort and - yes - cash in this great adventure. Personally, I think the investment paid off very well, giving SinnerSchrader a lot of visibility far beyond the scope we reached in pre-NEXT times. But there is always the burning question of sustainability. How long can we afford to invest more and more money in this hungry brainchild of ourselves? It was clear for quite some time that we needed a strong strategic partner, that we needed more know-how to run the successful, professional event that NEXT had become over the years. Therefore, I'd like to thank Holger Knapp, Managing Director of dfv media group, for believing in NEXT as well as in us, and for setting up our new partnership. Looking forward to the next steps! Then there is my incredible team. Quite small, compared to other events, but with a great heart: Marina, who managed the whole programme with all the speakers, stages, and workshop rooms, with the immense help of René and Xenia; our curators Monique van Dusseldorp, who also moderated the main stage together with Jochen Wegner, and Peter Bihr; Ina Feistritzer, our head of communications (including PR, creative/creation, and marketing), with Nico Mohrmann, the man for all things website, social media, and online marketing, and Svenja Hucker, queen of newsletter and big data; Jessica Storch, managing the event and taking care of the sponsors at the same time, with support by Zofia; and last, but not least, Pio for finding us partners who helped making NEXT14 happen. Julian left us last December to help building CURVED, Sheng jumped off board and was chartered by Commerce Plus, Alisha came back again and managed our team of volunteers for the event. Benjamin was always helpful and supported us wherever he could. A special thanks goes to Judith Andresen - it was just a one-day workshop in early January, but what a difference a day made! On the dfv side we had the pleasure to work with Christine Winter, Olaf Tomscheit, Sandra Kley, Judith Scondo, Sarah Stenger, Katrin Schickel and Valerie Berger (in order of appearance). Many partners made NEXT14 possible, all of them are listed below with their respective logos and links. I include them here for future reference: T-Systems (gold partner), KPMG (silver partner), DriveNow (mobility partner), Softlayer, mynewsdesk, Medienboard Berlin-Brandenburg, nexmo, Capital, Business Punk, edenspiekermann_, Grabarz & Partner, adparlor, absence.io, and Semfox (all supporting partner), Berlin Web Week, startupbootcamp Berlin, Sensorberg, media.net berlinbrandenburg, némata, Spreadshirt, 23 Video (all event partner), Horizont, t3n, WIRED, TNW, CURVED, ZEIT Online, WirtschaftsWoche, The Huffington Post, Internet World Business, Gründerszene, Venture Village, Rude Baguette, VentureCapital Magazin, foundum, Motherboard, marketing Börse, Mobile Groove media, etailment, and Werbeplanung.at SUMMIT (all media partner). Thanks again! A very special thanks goes to Hermann Henselmann who was the architect of the bcc Berlin Congress Center. This building is the work of a genius. It works incredibly well for its purpose, scales nicely and is managed by a highly professional, helpful and likeable team. A team of contemporary architects under the label raumlabor added a second, temporary layer to Henselmann's work, just for the two event days. Thanks again to Andrea Hofmann, Christof Mayer and Francesco Apuzzo (with Marius Busch and Martina Blom) for their meticulous work! The UX design of NEXT14 was done by precious design studio, our neighbours in Hamburg. They refined and enhanced the visual identity of NEXT and produced everything visual, starting with the website design and all the digital things, the printed material and finally all the location branding, wayfinding and screen design. Kudos to Christophe Stoll, Henryk Wollik, Christopher Jung et al.! The sound design was produced by Philipp Granzin who also supported the motion design. Besides, precious was also responsible for the NEXT NOW app, developed by Heiko Behrens (for both iOS/Android) and supported by Sensorberg with regard to the iBeacon integration and location-awareness. This website is the work of némata. Many, if not most blog posts are written by Adam Tinworth, especially the incredible live-blogging. The video production was done by Streamhub. Salute to Tim Ottowitz and his team! Side events took place at the Soho House Berlin, the Gretchen Club (with the support of media.net berlinbrandenburg and their Web Week Lounge), and the Web Week Night together with re:publica and Media Convention Berlin at the Station Berlin. It might be a bit early to judge with the Berlin Web Week still going on, but I have the strong feeling that it was the best Web Week ever, with lots of very different events under the same umbrella, sharing the common passion for all things digital. I shall mention Berlin Partner who run the Berlin Web Week brand and the Senate Department with the hilarious abbreviation SenWTF. Who did I forget? Let's not forget the rock stars of every conference, the speakers, moderators, judges, and finally the attendees. We made this event for you, and we sincerely hope that you enjoyed it. Judging from the feedback we got so far, that might be the case. And this leaves me with satisfaction and inner peace, now that my cord is gone. NB: I will update this post with more names until everyone is mentioned who should be.